A long time ago there was a man who had two wives. They were not good women; they did not look after their home nor try to keep things comfortable there. If the man brought in plenty of buffalo cow skins they did not tan them well, and often when he came home at night, hungry and tired after his hunting, he had no food, for these women would be away from the lodge, visiting their relations and having a good time. 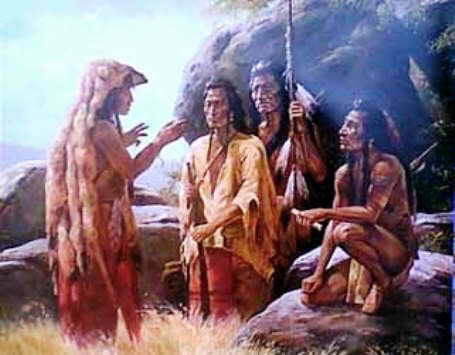 The man thought that if he moved away from the big camp and lived alone where there were no other people perhaps he might teach these women to become good; so he moved his lodge far off on the prairie and camped at the foot of a high butte. Every evening about sundown the man used to climb up to the top of this butte and sit there and look all over the country to see where the buffalo were feeding and whether any enemies were moving about. On top of the hill there was a buffalo skull, on which he used to sit. One day one of the women said to the other, "It is very lonely here; we have no one to talk with or to visit." "Let us kill our husband," said the other; "then we can go back to our relations and have a good time." Early next morning the man set out to hunt, and as soon as he was out of sight his wives went up on top of the butte where he used to sit. There they dug a deep hole and covered it over with light sticks and grass and earth, so that it looked like the other soil near by, and placed the buffalo skull on the sticks which covered the hole. In the afternoon, as they watched for their returning husband, they saw him come over the hill loaded down with meat that he had killed. When he threw down his load outside the lodge, they hurried to cook something for him. After he had eaten he went up on the butte and sat down on the skull. The slender sticks broke and he fell into the hole. His wives were watching him, and when they saw him disappear, they took down the lodge and packed their dogs and set out to go to the main camp. As they drew near it, so that people could hear them, they began to cry and mourn. Soon some people came to meet them and said, "What is this? Why are you mourning? Where is your husband?" "Ah," they replied, "he is dead. Five days ago he went out to hunt and he did not come back. What shall we do? We have lost him who cared for us"; and they cried and mourned again. Now, when the man fell into the pit he was hurt, for the hole was deep. After a time he tried to climb out, but he was so badly bruised that he could not do so. He sat there and waited, thinking that here he must surely die of hunger. But travelling over the prairie was a wolf that climbed up on the butte and came to the hole and, looking in, saw the man and pitied him. "Ah-h-w-o-o-o! Ah-h-w-o-o-o-o!" he howled, and when the other wolves heard him they all came running to see what was the matter. Following the big wolves came also may coyotes, badgers, and kit-foxes. They did not know what had happened, but they thought perhaps there was food here. To the others the wolf said, "Here in this hole is what I have found. Here is a man who has fallen in. Let us dig him out and we will have him for our brother." All the wolves thought that this talk was good, and they began to dig, and before very long they had dug a hole down almost to the bottom of the pit. Then the wolf who had found the man said, "Hold on; wait a little; I want to say a few words." All the animals stopped digging and began to listen, and the wolf said, "We will all have this man for our brother; but I found him, and so I think he ought to live with us big wolves." All the others thought that this was good; and the wolf that had found the man went into the hole that had been dug, and tearing down the rest of the earth, dragged out the poor man, who was now almost dead, for he had neither eaten nor drunk anything since he fell in the hole. They gave the man a kidney to eat, and when he was able to walk the big wolves took him to their home. Here there was a very old blind wolf who had great power and could do wonderful things. He cured the man and made his head and his hands look like those of a wolf. The rest of his body was not changed. In those days the people used to make holes in the walls of the fence about the enclosure into which they led the buffalo. They set snares over these holes, and when wolves and other animals crept through them so as to get into the pen and feed on the meat they were caught by the neck and killed, and the people used their skins for clothing. One night all the wolves went down to the pen to get meat, and when they had come close to it, the man-wolf said to his brothers, "Stop here for a little while and I will go down and fix the places so that you will not be caught." He went down to the pen and sprung all the snares, and then went back and called the wolves and the others�the coyotes, badgers, and kit-foxes�and they all went into the pen and feasted and took meat to carry home to their families. In the morning the people found the meat gone and all their snares sprung, and they were surprised and wondered how this could have happened. For many nights the nooses were pulled tight and the meat taken; but once when the wolves went there to eat they found only the meat of a lean and sickly bull. Then the man-wolf was angry, and he cried out like a wolf, "Bad-food-you-give-us-o-o-o! Bad-food-you-give-us-o-o-o-o!" When the people heard this they said to one another, "Ah, it is a man-wolf who has done all this. We must catch him." So they took down to the piskun pemmican and nice back fat and placed it there, and many of them hid close by. After dark the wolves came, as was their custom, and when the man-wolf saw the good food, he ran to it and began to eat. Then the people rushed upon him from every side and caught him with ropes, and tied him and took him to a lodge, and when they had brought him inside to the light of the fire, at once they knew who it was. They said, "Why, this is the man who was lost." "No," said the man, "I was not lost. My wives tried to kill me. They dug a deep hole and I fell into it, and I was hurt so badly I could not get out; but the wolves took pity on me and helped me or I would have died there." When the people heard this they were angry, and they told the man to do something to punish these women. "You say well," he replied; "I give those women to the punishing society. They know what to do."